Gardens are a relatively young subject for academic study. They have often been subsumed by art history and considered lower still than landscape architecture, which has only recently gained its own independence as a sub-field of architecture. This is not surprising when traditionally the emphasis has been placed on garden design, strangely divorced from meaning. The idea that gardens have an ideology is a contentious point for garden historians, creating a divide between scholars who know gardens to be cultural constructs that must be seen in a broader sociological and political perspective, and those who consider gardens as neutral or pure, devoid of political or professional interests. The notion that life’s relentless series of hurdles and shocks are stilled by the peace and tranquility of a garden is nature’s little secret myth for there is no place more fertile to the phantoms of conscience than the relentless growth of the green world. Wasn’t it Henry David Thoreau who walked around Walden Pond while contemplating the nastiness of encroaching industrial progress, and Vita Sackville-West who after traveling to the Far East returned to her isolationist England even more determined to keep out exotics from her garden? Yet, the Chinese have known forever that the garden is both a microcosm of our spirit and simulacra of reality. Thanks to the commercialism that surrounds us and dumbs down our understanding of complex structures, too many escapist notions about gardens have contributed to why they have not, until recently, received critical attention. The image of the garden as the exclusive domain of blue-haired ladies with their dubious sense of propriety channeled in their choice of colors and style of garden somehow still haunts the field. This is why it seems irresponsible to examine only the formal aspects of gardens without accepting all the reasons for why they were created. There have been numerous exhibitions about gardens and several about artists’ gardens showing great big pictures of artists in their gardens or painterly versions of their gardens by the artists themselves. The whole enterprise of gardens and artistic renderings of gardens is a seasonal topic with therapeutic intensions and life affirming results. Not all gardens are the panacea of their creators or publics. This study will not perpetuate a restricted examination of the formal aspects of gardens but present a selection of divergent positions taken both from lived experience and scholarship. In this effort Down the Garden Path: The Artist’s Garden After Modernism moves away from the narrow representation of only exhibiting garden documents, to show a broad range of materials that refer to gardens as metaphors or points of departure to understand history, politics, and our relationship to nature. There is a long and distinguished list of artists’ gardens. Presented here is a small selection chosen from the vast history, not because they are well known for several of them are imaginary and another has been all but destroyed, but because of their integrity to an uncompromising position about the world. The exhibition is composed only of artists, many of whom have created gardens and others who have thought long and hard about them with the result being a complex presentation that draws from other practices and disciplines and to which the garden is a catalyst. It was important that the exhibition focus on artists’ production as opposed to landscape architects, to which the genre is more commonly associated, simply to establish the subject of the garden as equally legitimate as any other topic, and an increasingly popular area of exploration for artists. The exhibition begins with three major artists for whom the garden was a central preoccupation in their work if not the single most important passion in their life. Their practice spans three corners of the earth. Roberto Burle Marx lived and worked mainly in Brazil, but his designs also reached North America, Europe and Asia. Isamu Noguchi, who brings a decidedly Eastern aspect to the exhibition, was also an international artist based in Japan and New York, but left a legacy all over the world. Ian Hamilton Finlay is based in the Petlands of Scotland. While his work plays with language and European history, for the purposes of analogy I would like to think that he brings a Northern sensibility to the exhibition. While Herbert Bayer is unfortunately not in this exhibition, his two or three projects which could be considered a type of garden or earthwork are represented in the catalogue and as a German émigré to the US, he will serve as representative of the West. From these eminent positions the exhibition turns to the evolution of ideas about paradise, memorial, private and public as well as working gardens. Vito Acconci, Ghada Amer, Lothar Baumgarten, Roberto Burle Marx, Tom Burr, Mel Chin, Thierry De Cordier, Mark Dion, Stan Douglas, Ian Hamilton Finlay, Dan Graham, Lonnie Graham, Paula Hayes, Jenny Holzer, Ronald Jones, Anissa Mack and Dave McKenzie, Gordon Matta-Clark, Franco Mondini-Ruiz, Isamu Noguchi, Nils Norman, Christian Philipp Müller, Ingrid Pollard, Robert Smithson, Alan Sonfist, Brian Tolle and Diana Balmori, Sergio Vega, Jan Vercruysse and Meg Webster. 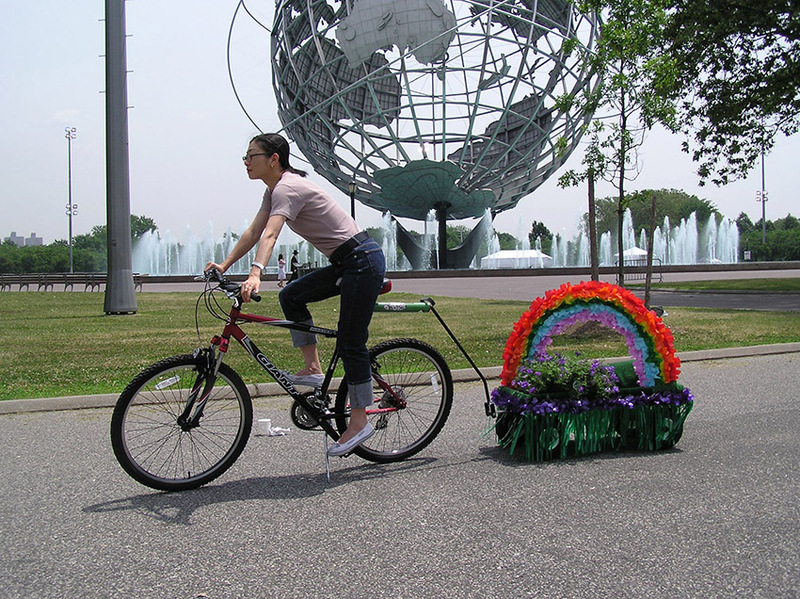 Lonnie Graham, Franco Mondini-Ruiz, Ghada Amer, Brian Tolle and Diana Balmori, and Anissa Mack and Dave McKenzie will install five new works in the open spaces adjacent to the museum in Flushing Meadows Corona Park and the nearby Queens Botanical Garden. Down the Garden Path: The Artist’s Garden After Modernism is made possible by an Emily Hall Tremaine Exhibition Award. The Exhibition Award program was founded in 1998 to honor Emily Hall Tremaine. It rewards innovation and experimentation among curators by supporting thematic exhibitions that challenge audiences and expand the boundaries of contemporary art. The additional funding is provided by National Endowment for the Arts, New York Council on the Arts, Furthermore…A program of the J.M. Kaplan Fund, and The Florence Gould Foundation. 176-page fully illustrated exhibition catalogue will be available at the Museum Shop and online in summer 2005. To reach the Queens Botanical Garden, visitors may take the IRT No. 7 to Shea Stadium/Willets Point where the Queens Culture Trolley will be shuttling people back and forth to the Queens Botanical Garden; By Car (LIE to Exit 23, Main Street or Van Wyck Expressway to Exit 12A, College Point Boulevard); or By Bus, take Q44 southbound bus. For complete travel information, please call 718.886.3800.